you know Chris Zanardi of Five Eyed Hand. His relentless pursuit of playing countless show’s, developing a fan base, touring the west coast and working hard onstage hasn’t gone unnoticed. The guys in 5EH all strive for perfection and it’s evident in every show they perform. Chris Zanardi plays lead guitar for the band and is the driving force behind the 5EH community. All Chris wants to do is play music and get the praise he deserves. 5EH is one of those bands whose talent outweigh’s their draw numbers but slowly the boys are making a name for themselves in the Jambandfriendly Community. According to the bands website, 5EH “blends expansive instrumental jam compositions with fun and catchy vocal tunes to form an engaging and captivating music experience that inspires dance floors to quake and tail feathers to shake. One never knows what surprises these guys might pull out. The band sees each show as a special opportunity to participate in creating magic with the audience and with each other”. I hear many influences in the band’s sound but they have a uniqueness that is upbeat, danceable, and interesting. Chris’ stellar guitar lines are a bit ‘Kimocky’ but also exhibit that ‘Kang Twang’ with phrasing like John Gutwillig of the Disco Biscuits. Songs are lengthy and take the crowd on a meandering journey just like a JamBand should and that’s what audiences want to hear. I caught up with Chris at his campsite amidst the High Sierra Music Festival. Outside his compound, behind tapestries, tents and a motor home read the sign “Sleep Deprivation Tank”. I had been hearing about this phenomenon for years from friends and had to guess that musicians played well into the night if they couldn’t sleep. Chris and I have known each other for years and jumped at the chance to get ten minutes with him before the jams began. We climbed into the Winnebago with a bunch of bay area musicians in toe, hit the record button and spoke with Chris about 5EH and stories from the road. Chris, bring us up to speed! What have you been up to the last six months? Oh wow, we just recently put out a studio album which we are really excited about called ‘Five Eyed Hand’ ; but I guess I should go back even more on the timeline for ya. There’s a bunch of demo’s and EP’s along the way but those don’t really count. Official UPC codes, that’s where you start talking official markings on your timeline where you are making a little mark in history. I’ve got a friend over here who know’s all about that, Peter from “Seconds on End” he’s done a few UPC codes. Our first one that we did ourselves was a live one called “Churned to Live” And that was great. But this one we did at OTR studio’s with this lady Cookie Marceno, that was all analog two inch on the Atari System. I heard recently that you guys have a lot of success on the road. What cities north of the bay area have been hot? What’s been fun for you? Portland, right off the bat I’d say. Every time we go to Portland we’re creating new friends and there’s such good people there. A totally stoking crowd, stoking music-scene up there. Good venues too, getting over 130 people every night Thursday, Friday or Saturday it really doesn’t matter and you get a lot of repeat people which is really nice. We’ve gone as far north as Seattle right now, Shasta a few times, up north Redding and Humboldt so we’ve really been working that region and that’s been a treat. I’d say the other place that has been treating us well is kind of close to Quincy is Chico, there’s massive chico connection thru this festival called Bobolink that we have played the last three years there and that draws a huge Chico crowd. It’s only about an hour outside of Chico. So our first year of Bobolink we also played High Sierra the same year so that was great little booster pad for us. We have sort of been riding a wave since then in regards to people seeing our show. Chico has blown up considerably, we are packing places in there consistently. We’ve been to the town atleast three to four times; its funny its something about Chico, it’s amazing what happens when you leave the bay area and the confines of your hometown. Playing the Yankee for 10 years, Santa Cruz and Don Q’s; it’s fun to really get out to some of these other places, where you are out of town. And there’s a whole other energy to out of town show’s. Home away from home! What’s the theory behind 5EH, for folks who have never seen a show what’s the sound, what can they expect? How does 5EH fair on the road, is it easy for ya? Awesome, you know what I love if we are playing three or five shows in a row every single time at the end of that string of show’s everybody jokingly says ‘So when’s the next show, where are we going next tonight!’ Everybody wants more they are fired up, it’s like we’ve been sling shotted into wanting more and what more can you ask for from everybody; we all want to play and get proper sleep while doing that but regardless the stoke is there. And that’s a real blessing to be able to play with people who also do that. Chris, it’s been said there is something very special about stepping on stage. I am curious what your feelings are about the load in and finally getting onstage and setting up your area . Please comment on the whole process, what’s it like for Chris Zanardi to step onstage. I can’t wait to set up my gear every day, I can’t describe it, I love setting up my stuff. Whether it’s recording gear, or mainly guitar gear that’s even more stoking you know to set up my stuff obviously means a lot before the show. For our jambandfriendly fans Chris has a very complex peddle board and as you can see it definitely is a process. I personally loved stepping onstage when I toured with ‘is trio’ and creating my zone, my area. I thought that was an elated and special time of touring. Before you hit, nothing in life mattered except for that moment. We were able to watch the room metamorphasize with our fans who were all part of the process. In the jamscene, crowds mean everything! Chris what’s planned for the rest of the summer and into the fall? There’s a bunch of tours in the works, our next show coming up in Reno with Isabella, then at Coopers in Nevada City in August. In the next two months technically it’s a little slow for 5EH, we are taking some time off but its OK because the ebb and flow is cool. We are busy thru the whole year. After a knock at the door, someone yelled ‘Chris Zanardi, you have a visitor’ and I realized my time with Chris had come to an end. In the room with me are: Peter Soyer, Brian Vandemark and Dan Hendrix all from the band ‘Seconds on End’. And of course, Bill Ward, or Bill on Bass, Bill on lights who has been from what I hear an integral part of 5EH Experience. Believe it or not he might be the only other bass player who has played in the band. Chris, thank you for your time. We look forward to seeing you on the road. 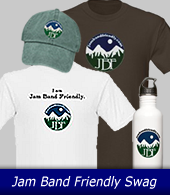 jambandfriendly.Com supports you and wishes you luck in the coming year.